Anne Happy is a slice-of-life comedy about five girls who have extraordinarily bad luck. Because of their terrible luck, the five characters are enrolled in a "Happiness Class" that is supposed to help them with their misfortune. However, instead of offering therapy, this class offers “interesting” (or rather, insane) activities for the girls to participate in, making their already odd lives even crazier. The characters are the strongest aspect of Anne Happy. There’s Hanako who experiences misfortune in every sense of the word; Botan who has incredibly poor health to the point where it is ridiculous and funny; Hibiki who has horrible navigational skills and easily gets lost; Ren who has female animals constantly fawning over her because they are attracted to her charm; and finally there is Hibari whose misfortune takes the form of love because she is in love with a construction site sign. With all of the insanity, the audience gets to follow the characters through their misfortune- ridden lives. We get to witness all of the crazy things they go through on a daily basis and, frankly, it is fun and amusing. The facts they all have different kinds of luck helps to make things less redundant. You never know what sort of disaster is going to befall them next. When catastrophe does strike, it is usually in a comical manner and the characters struggle through their difficulties in chibi form, giving an extra cutesy vibe to the already adorable atmosphere. The constant chibi portrayals were one of my favorite things about the show's animation. Overall, the animation gives a unique feeling to the show. Each character has adorable character designs. One thing that particularly stood out was the use of watercolor. The background uses beautiful pastel colors and water color brush marks. The show is extremely colorful and pleasing to the eyes. Another aspect, although quite minute, was the characters' hair, especially Hibari's. If you look closely, her hair is two shades of purple, but it is blended so well that it is hard to notice. This attention to detail shows much effort the animators put into this show. Firstly, Timothy, a mechanical bunny robot and the mascot of the show, was extremely annoying, in my opinion. Appear-wise, he is adorable; however, his squeaky voice and personality are irritating. But most importantly, whenever Timothy was around, the show focused on him instead of the characters. That was my main issue with the show: the story. It is a slice of life anime, meaning that, instead of a clear-cut story, the show is shown through small snapshots of the characters' lives as they go through their daily routines. Because of this, most SOL anime have little, if any, story or plot. Anne Happy is much the same. However, instead of really focusing on the girls' everyday lives, it focuses their experiences in the insane "Happiness Class." This class, as I mentioned earlier, does all kind of ludicrous things to make the students happier. Some highlights include a life-size board game, a virtual casino, and a game of tag that was more like a man hunt. Seeing what sort of silly scenario the class had to go through was entertaining, but the show focused too much on the spontaneity of the "Happiness Class." The show should have focused on learning more about the characters as people. Was there a reason for their bad luck? How did their bad luck affect their families and friends? How do the girls react to the constant stream of misfortune that seems to follow them? Does Hibari ever find a love outside of a sign post? In my opinion, this would have been much more interesting to explore than robotic rabbits and a school with an obviously outrageous amount of spending money. Based on your personal preferences, yuri can be a good or bad thing. While it is not entirely yuri-based, Anne Happy definitely did have some yuri. The most yuriish moments are between Hibiki and Ren. As I said earlier, Ren attracts female animals because of her charm. However, it isn't just nonhuman species that like her. Human females are attracted to her as well, including Hibiki. As the series goes on, a lot of hints about Hibiki's feelings for Ren are thrown in. If you want heavy yuri, you would need to look elsewhere, but if you are interested in adorable shojou ai, I definitely recommend Anne Happy for a cute yuri fix. Despite some of its flaws, I really enjoyed Anne Happy's concept, animation, yuri, and its adorable and unique take on slice of life. Overall, I would give it an 4 out of 5. If you're looking for a funny super happy anime this is the one you'll wanna watch. It's a little weird but in a hilarious way. I thought I couldn't find something that I'd like as much as How to keep a mummy but I did! This is great and I would suggest it to anyone who wants to smile and laugh! I hope they do a second season. Anne-happy most definitely always made me smile and brightened up my day. The ridiculousness of the bad fortunes of these girls is what makes the show hilarious. But by far Timothy is what makes the show great(haha just kidding). In seriousness I cannot understand why people dislike this show but that is them. I also really enjoyed their teacher and her rather out there and slightly demonic personality. The friendship between all of the girls is rather touching as well. 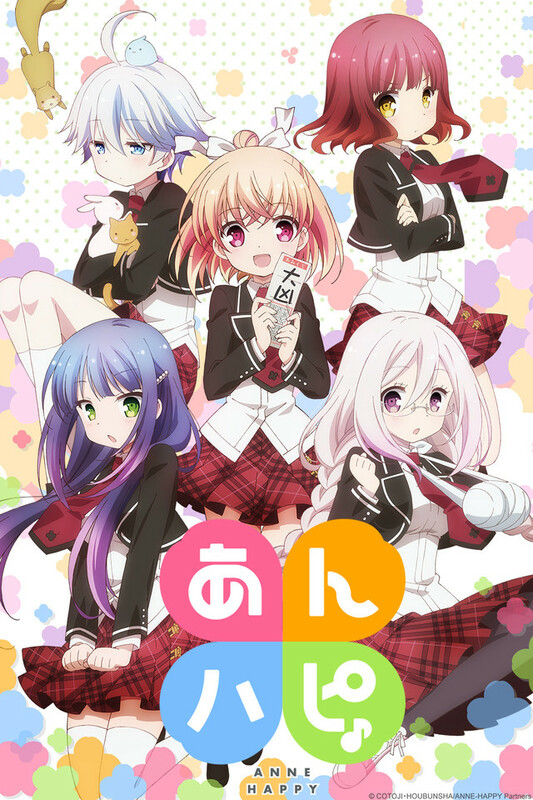 This show follows five girls in a class for those with very bad luck as they go about their daily lives and also try to survive through the class (and maybe improve their luck?). The primary focus is about absolutely adorable girls being super cute and very unlucky in ways that only serve to make them more adorable. The art and animation are also both gorgeous and really serve to highlight this cuteness very well. There is also no real plot to this and for the most part you can pick up any episode and watch it. The primary focus of the show is how the relationships between the girls grow over their school year and how they become closer as friends (and also how many cute things they can physically fit into a single episode). Despite giving this 4 of 5 stars though, I would recommend this to anyone who loves well drawn and super cute shows.